As an outpatient rehabilitation facility connected with a primary care clinic, Saint Charles Rehab Center has the opportunity to both meet the therapy and medical needs of the community. What started as an inpatient facility for addressing spinal cord injury and amputees related to the earthquake, has become one of the few facilities that have made stroke and stroke prevention and developmental delays in our pediatric population. Since January of 2011, one under served population that the center has been addressing are patients who have suffered from stroke. Inadequate nutrition and poor sanitation have contributed to a life expectancy of the average Haitian being between 44-50 with many having facing physical challenges from congenital deformities, stroke related paralysis to amputations, and head and spinal cord injuries. 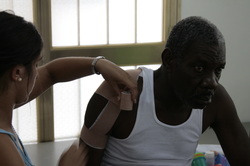 As our center and our stroke-related programming has grown, so has our reputation not just among patients, but Haiti's national hospital, private physicians, and other INGOs daily refer patients to our facility to help individuals and their families cope through daily home exercise, ample encouragement from our staff, and hope.